Here's a relic that was used 118 autumns ago in the classroom. 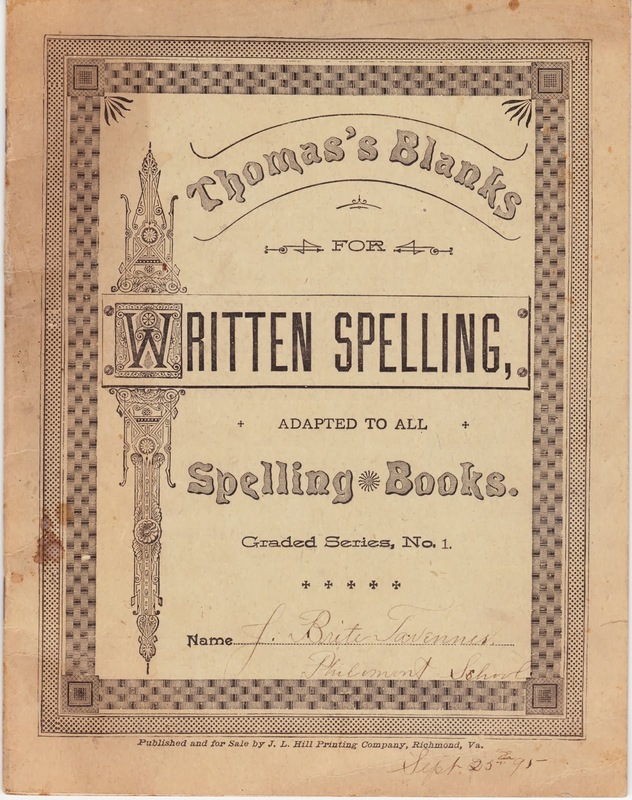 Shown above is the cover of Thomas's Blanks for Written Spelling, a staplebound booklet. According to the inside front cover, the teaching aid was copyright 1890 by Julian P. Thomas of Richmond, Va., and, according to the front cover, it was published and sold by J.L. 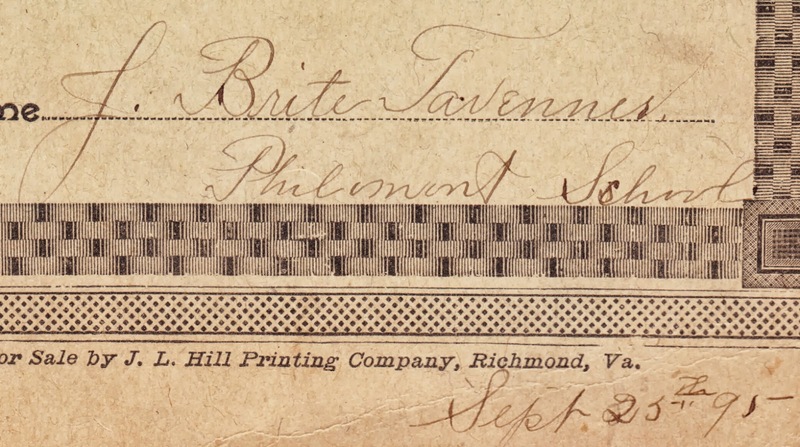 Hill Printing Company, also of Richmond. To me, that name looks like J. Brite Tavenner, who was a student at Philmont (Philomont?) School. The date is September 25, 1895. That could be Jonah Brite Tavenner, a name that appears in the U.S. census in 1880 and 1910. There is also, intriguingly, a 1939 obituary for Mary Garrett Van Sickler, who died in Philmont (Philomont? ), Virginia. One of her pall bearers was Brite Tavenner. Ten pages of the booklet are filled with Tavenner's spelling lessons. Words were read aloud to students and written in the right- and left-hand columns of each page. Misspelled words were then rewritten correctly in the middle column. 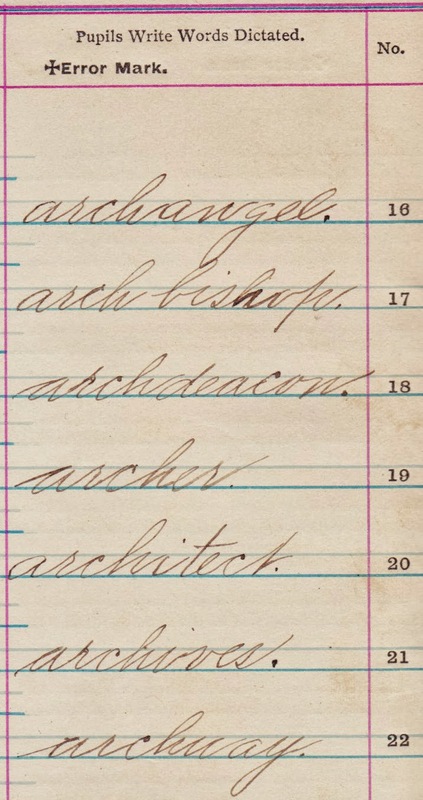 The words Tavenner had to learn included apostle, apocrypha, anthracite, anthropology, archangel, auspicious, audacious, attenuate, cochineal, cockroach, codicil, cohesion, concave, concentric, confederacy, constipate, contemporaneous and countermand. By my quick reckoning, Tavenner correctly spelled 288 of the 300 words that were dictated to him. That's 96 percent. Not too shabby! And these were not easy words. Certainly many of them would not be easy for contemporary grade-school students. Here's one of the words that he missed and had to write correctly.